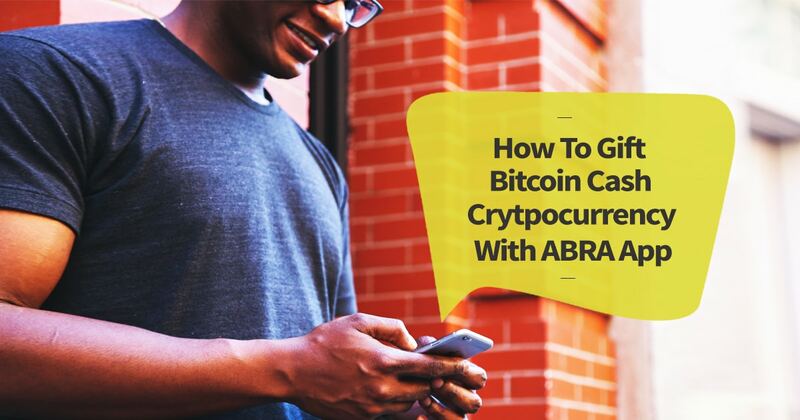 The Abra App is a cryptocurrency application that you can use to perform trades and money transfers to the most popular digial currencies such as Bitcoin Cash. Abra is making plans to distribute the application to users around the world in the coming months and is safe to use to gift Bitcoin Cash. The Abra app is currently available for iPhone and Android, although it still works only for users in the United States and few other countries. Abra’s new technology is in great demand, especially in the United States. Its ease of use allows users to buy cryptocurrency by simply connecting your bank account, credit or debit card. This makes it a snap for gift Bitcoin Cash or any other popular cryptocurrency. The application is a digital wallet enabling users to store money in digital format on their smartphone. After the money goes to the wallet, you can securely gift it to someone using the application. Just as most mobile money transfer solutions work, users can send money to any cryptocurrency address in the US and other countries. Recipients of funds can then withdraw digital currency in cash to their own bank account or hold it in their wallet as market values fluctuate. When using Bitcoin Cash as a way to transfer money between users, the company reduces the transfer fee to an absolute minimum. Abra is a much cheaper solution compared to other remittances in the United States, with an average cost of $25. The Abra team is making plans to expand the availability of its mobile applications in different countries in the coming months. The company’s employees shared that there is already interest from people who want to become the official representative of Abra Teller in 75 countries of the world. Enter the bitcoin wallet address that you wish to send he bitcoin to or scan the QR code with your Abra app. Enter the Bitcoin amount that you wish to withdraw or send out. Tap the confirmation button to confirm your transaction. You can then check the third party wallet to confirm if the transaction was successful. For Bitcoin cash withdrawals you will pay usually network charges. The charges are meant to confirm the Bitcoin cash through the mining networks and it could vary depending on the volume of transactions involved. If you wish to give Bitcoin Cash as a physical gift to your recipient you can purchase a cryptocurrency hard wallet. Similar to a jump drive this device plugs into your computer and grants you the ability to download your purchased crypto for safe storing. ← Black Digital Marketers – 3 Power Trends For Reaching African American Consumers.